Tomorrow at 3:00 PM, Reid Stowe will set sail on a history making voyage. 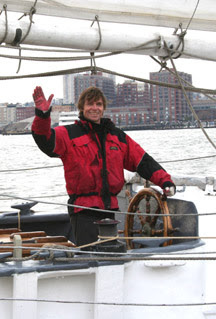 He and his crew, Soanya Ahmad will depart New York harbor for 1000 days, non-stop at sea, shattering all records. They will depart the pier with no plans to return to land, to a pier or re-supply for nearly three years. QuantumLimit interviewed Reid in two half hour interviews. Part I is available in today’s Podcast and Part II will be posted on Tuesday. In these Podcasts, Dennis Chamberland asks all the obvious questions and even a few more! To check out the 1000 Days at Sea website, click here. To review the complete QuantumLimit.com Podcast Catalogue, click here.